The Phorusrhacidae ("terror birds") are one of the most characteristic and best known avian groups from the Cenozoic of South America. Their taxonomy was revised by Alvarenga and Höfling (2003), who recognized five subtaxa, of which only the Psilopterinae, Patagornithinae, and Brontornithinae have a Paleogene fossil record. The taxonomic allocation of the fossils assigned to the latter is, however, challenged by the fact that Agnolin (2007b) assumed that the early Neogene Brontornis, the type genus of the Brontornithinae, is actually a representative of the Anseriformes, and is more similar to the Gastornithidae and Dromornithidae (Sects. 6.2, 6.3). These conclusions were based on the morphology of a quadrate fragment assigned to this poorly known taxon, whose mandibular process only exhibits two condyles as in Galloanseres, instead of three as in most Neoaves. The ungual phalanges of Brontornis are further not raptor-like as in typical phorusrhacids. If Agnolin's hypothesis is confirmed by future studies, erection of a new taxon would be necessary for the Paleogene species classified into the Brontornithinae, which clearly exhibit a phorusrhacid-like morphology. 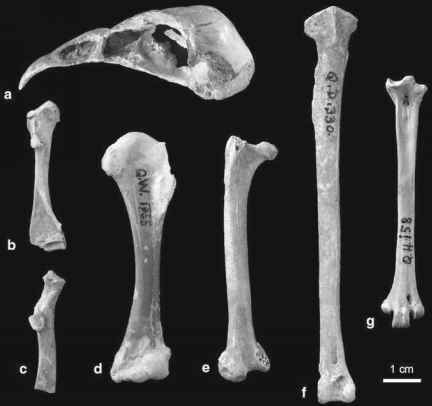 The earliest species assigned to the Phorusrhacidae is Paleopsilopterus itaborai-ensis Alvarenga, 1985 from the late Paleocene of Itaborai in southeastern Brazil, whose fossil record consists of a proximal tarsometatarsus and distal tibiotarsi (Alvarenga 1985a). P. itaboraiensis was classified in the Psilopterinae, which include rather small and gracile species with slender leg bones and a long and elongate tarsometatarsus. This assignment is, however, based on overall similarity and needs to be verified by additional specimens. (2004) further classified the alleged ciconiiform Ciconiopsis antarctica Ameghino, 1899 into the Psilopterinae. This species is based on an incomplete carpometacar-pus, which likewise comes from the Deseadan of Argentina, and may well also belong to a species of Psilopterus. Riacama caliginea Ameghino, 1899, which is known from the shaft and sternal extremity of a coracoid from the Deseadan of Argentina, was classified into the Cariamidae by Agnolin (2004). This species was assigned to the phorusrhacid Psilopterinae by earlier authors, but was considered to be of indeterminate affinities by Alvarenga and Höfling (2003), with whom I agree. The species of the Patagornithinae are medium-sized phorusrhacids, with a long and slender mandibular symphysis and elongated tarsometatarsi (Alvarenga and Höfling 2003). Their only Paleogene representative is Andrewsornis abbotti Patterson, 1941 from the Deseadan of Argentina. Of this species an incomplete skull, fragments of the mandible, a femur, an incomplete coracoid, and pedal phalanges were described. The Brontornithinae include the largest phorusrhacids, which reached a standing height of more than 2 m, given that the Neogene taxon Brontornis is indeed a pho-rusrhacid bird (see above). Brontornithines are more massively built than other phorusrhacids and have a much shorter and stouter tarsometatarsus. The earliest species is Physornis fortis Ameghino, 1895 from the Deseadan of Argentina, whose fossil record consists of mandible fragments and a few other incomplete bones. Much better documented is Paraphysornis brasiliensis (Alvarenga, 1982), which is based on a fairly complete skeleton from the late Oligocene/early Miocene of the Taubate Basin of Brazil (Alvarenga 1982, 1993). This species was very large, with an estimated weight of about 180 kg (Alvarenga and Höfling 2003). In addition to these South American specimens, an incomplete beak and associated bones (including a distal tarsometatarsus) from the late Eocene of Seymour Island (Antarctica) were tentatively assigned to the Phorusrhacidae (Case et al. 1987; Tambussi and Acosta Hospitaleche 2007). The fragmentary remains of the alleged phorusrhacid Cunampaia simplex Rusconi, 1946 from the late Eocene (Divisaderan) of Argentina are nonavian and probably belong to the Crocodylomorphae (Agnolin and Pais 2006). Phorusrhacids show a significant variation in size, with representatives of the Psilopterinae being of size similar to that of the extant Cariama cristata, whereas P. brasiliensis approached the size of the early Miocene Brontornis burmeisteri Moreno and Mercerat, 1891, a species which had an estimated height of 175 cm "at the level of the back, and the head, when well raised, could have reached around 280 cm high" (Alvarenga and Höfling 2003, p. 59). All species whose skull is known had very large, mediolaterally compressed, raptor-like beaks (Fig. 13.1). In contrast to the skull of extant Cariamidae, that of phorusrhacids exhibits functional basipterygoid processes. Even in the early forms, the wings seem to be greatly reduced and the coracoid is long and slender, without an acrocoracoid process. As in other large flightless birds (e.g., the Gastornithidae and Dromornithidae), the ribs lack uncinate processes. The phylogenetic affinities between the various described forms are uncertain. There can be little doubt, however, that the small size and elongate leg bones of the taxa united in the Psilopterinae are plesiomorphic for the Phorusrhacidae. short and stout in brontornithines. Certainly the latter were thus graviportal rather than cursorial birds, and Alvarenga and Höfling (2003) hypothesized that brontornithines may have been scavengers. Whereas Tambussi and Acosta Hospitaleche (2007) assumed flight capabilities for the smaller Psilopterinae, all phorusrhacids were considered flightless by Alvarenga and Höfling (2003). These authors further noted that some phorusrhacids may have been sexually dimorphic in size and morphological features.